In the south, we have traditions for each family to follow in the tamil month of Thai and Adai. Each family, on one of the four Fridays of the month (Thai) or ( Adai) will light a lamp made with flour and ghee to their family god and goddesses. Later the flour is mixed with the ghee, coconut and made into ladoos, to be distributed to family and friends. 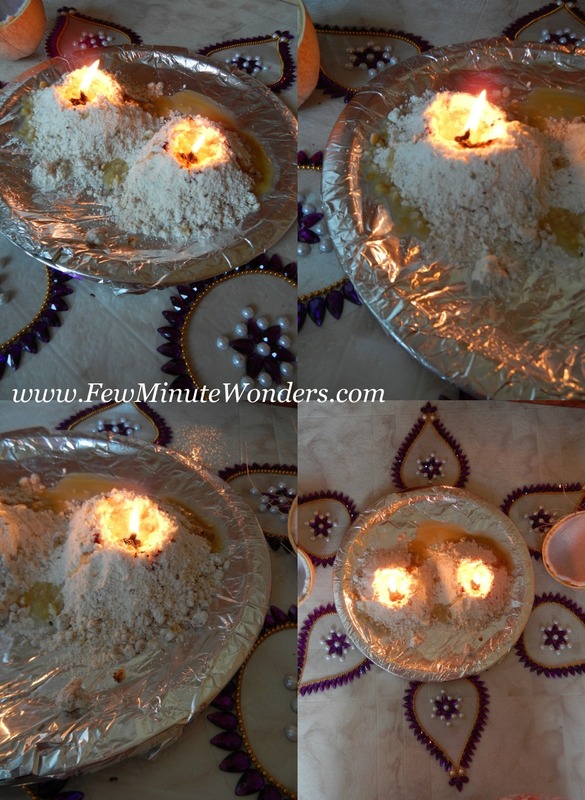 This is popularly known as Maa (flour) Vilakku ( lamp). To keep up with the traditions, I offered maa vilakku on Friday as it was Thai ( Jan 15th - Feb 15th) Velli ( Friday). 1. Measure the dry ingredients in a bowl. Mix well and make 2 equal heals of the dry mix on the plate. 2. Make a small well in the center of each heap with the fore finger. 3. Place the cotton wick and cover the well with melted ghee. Light the lamp and add ghee as required for the lamp to keep burning for some time. 4. Once the lamp put itself out. Remove the blackened wick and mix the ghee that is soaked in the flour along with the coconut. Make a stiff dough and make into ladoos. Amma used make maa vilakku, Missing now. Great post. What a lovely and traditional post!!! love the clicks!! Just love this maa vilaku, we do adai after the pooja,never tried as laddoos.